If you want to integrate your extensions tightly with the E-Business Suite, you should use the OAF Release 12 technology stack, which includes the use of JDeveloper 10g and ADF BC (or use OAF Release 11i, which uses JDeveloper 9i). If you are building a separate application that does not integrate tightly with the E-Business Suite, but needs E-Business Suite-specific capabilities like Flexfields and personalization, you should use the OAF Release 12 technology stack. 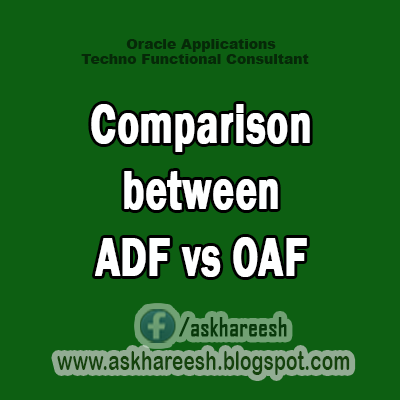 If your application does not need to integrate with the E-Business Suite, or doesn't require any of the E-Business Suite-specific capabilities enumerated above, you should use ADF 10g with SOA based integration with E-Business Suite. If you are building a separate application that does not need to integrate at all with the E-Business Suite, and you need an AJAX-style rich client user interface, you should use ADF 11g.